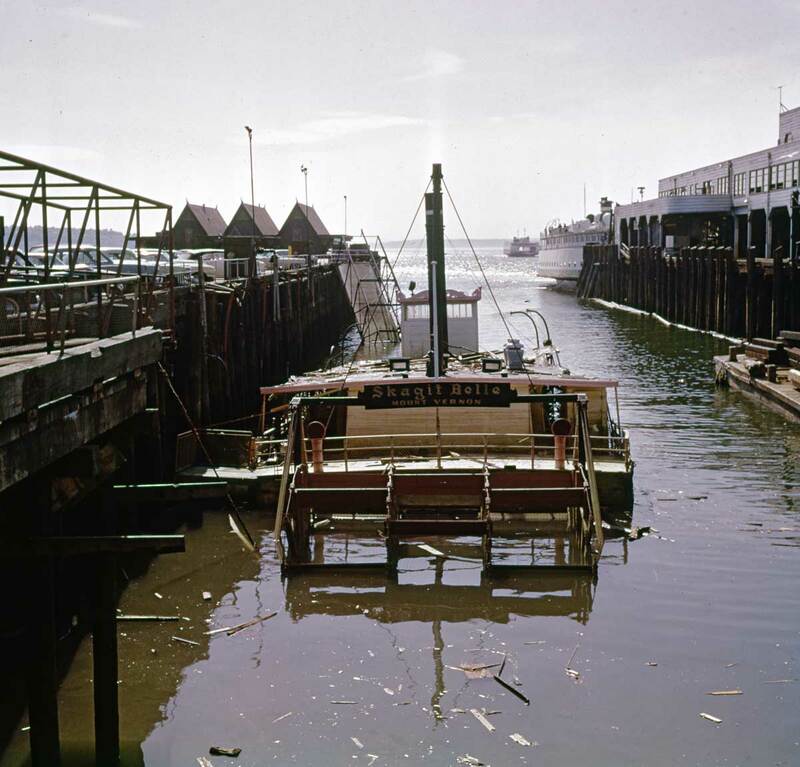 THEN: Thanks to Seattle Public Library librarian John LaMont for finding Werner Lenggenhager's 1961 record of the stern-wheeler Skagit Belle waiting between now-long-gone Piers 50 and 51. 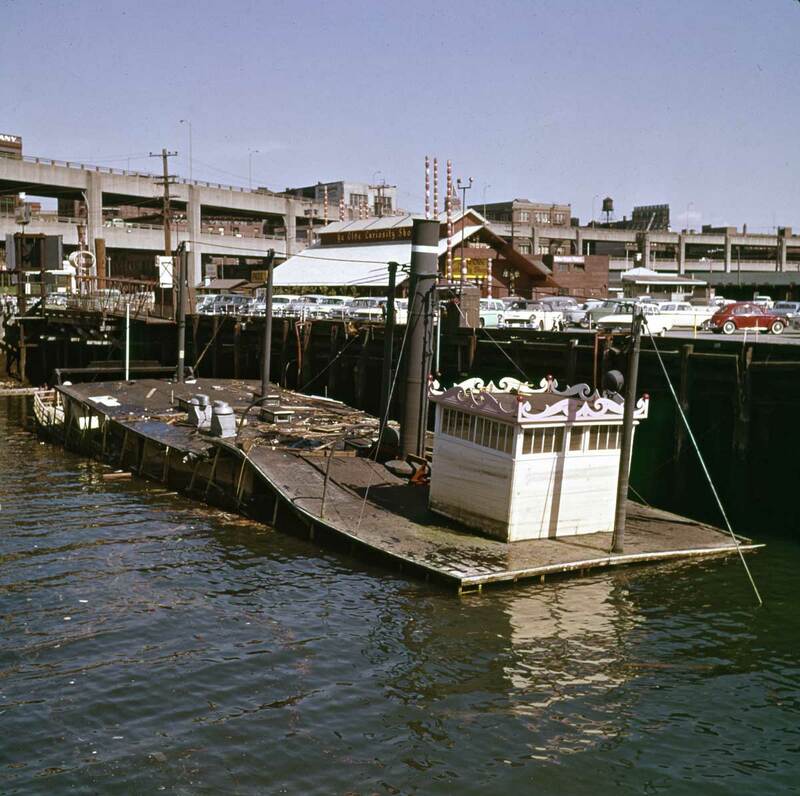 At the water end of Yesler Way, this slip was the pioneer-era site of Yesler's Wharf. 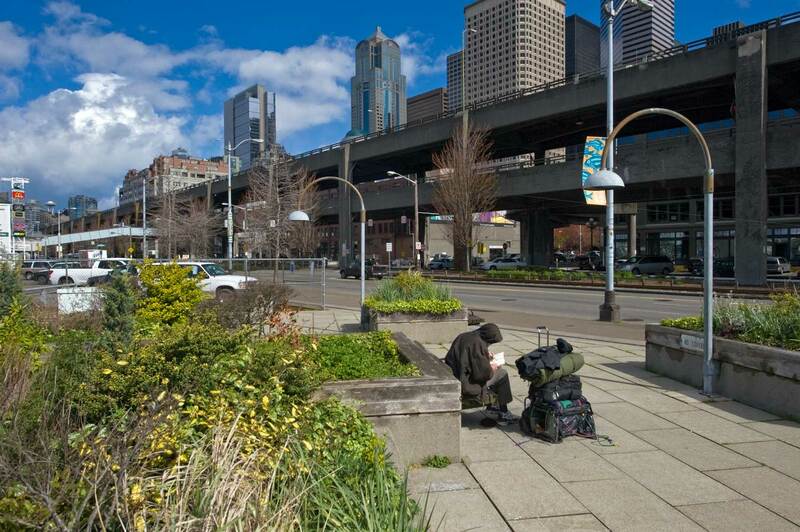 NOW: To help understand the setting south of Colman Dock, Jean's "now" shot is much wider than Werner's "then." Many Pacific readers will remember the Polynesian Restaurant built at the water end of Pier 51 in 1961, in time for the following year’s infusion of tourists for the city’s Century 21 World’s Fair. 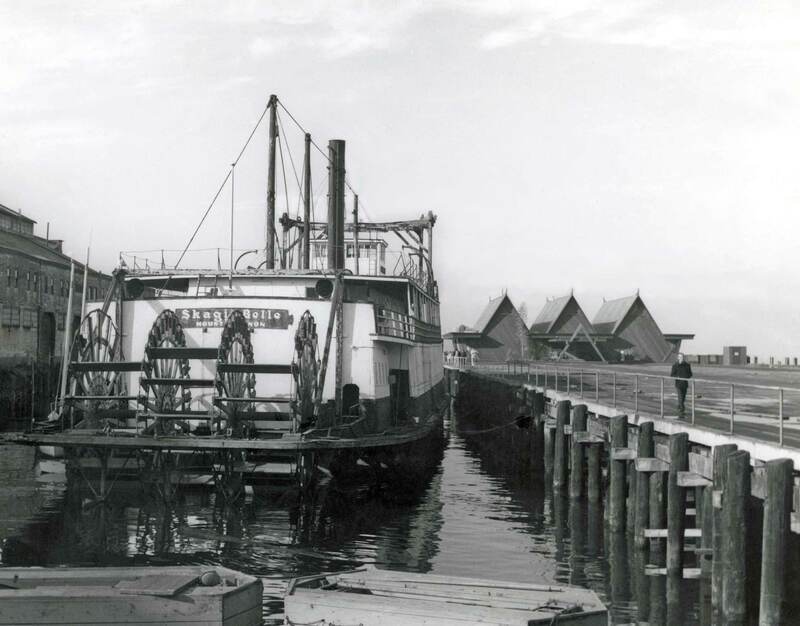 Some minority of you will also remember the Skagit Belle, a stern-wheeler parked beside the same pier for yet another food attraction in time for the fair. This view of the two is by Werner Lenggenhager, the helpful Boeing retiree who, beginning in the 1940s, wandered the city and the state with his camera. This photo is stamped Oct. 28, 1961. The Polynesian is up but not completed, and the stern-wheeler is waiting south of the pier before it was moved to the north slip, fitted for a restaurant and painted like a vaudevillian in pink and blue. 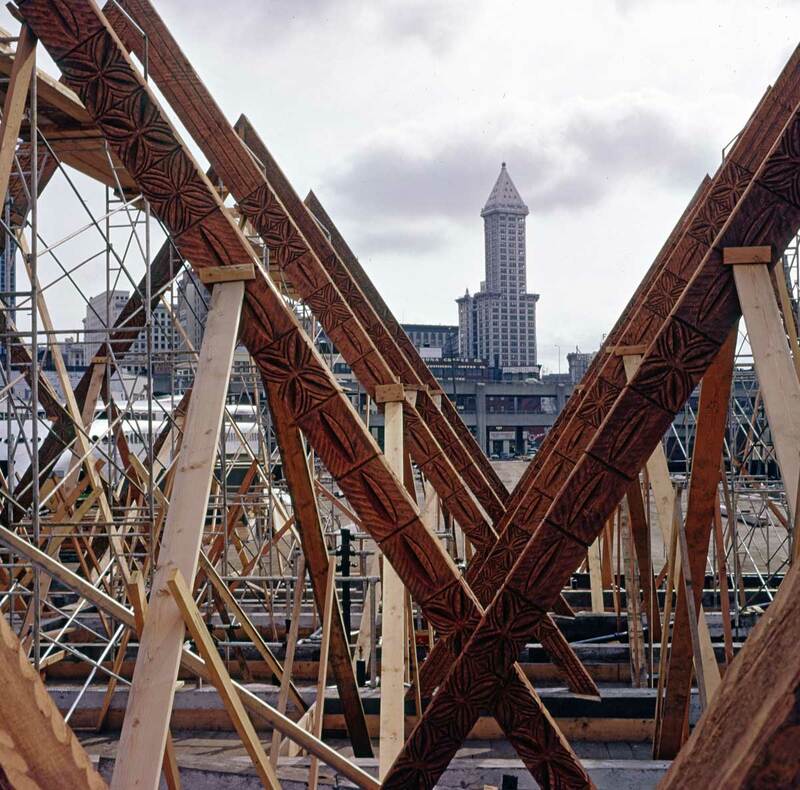 Through its 20 years at Pier 51, the Polynesian was Seattle’s grandest example of Tiki décor, an exotic mix of island styles, perhaps best associated here with the chain Trader Vic’s (not Joe’s). 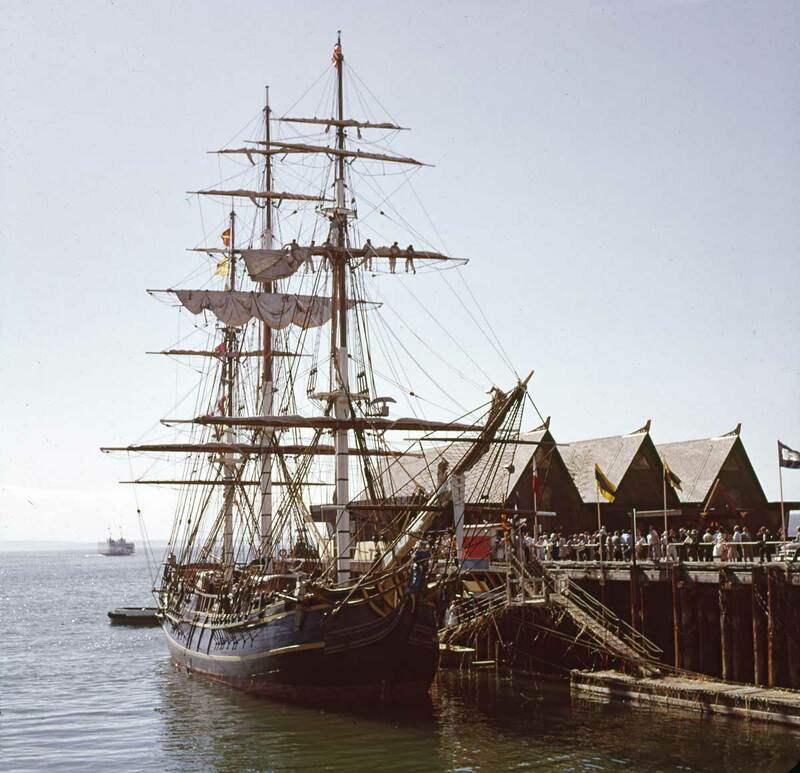 The Polynesian was lost to public domain in 1981 and the expansion of the ferry terminal, Colman Dock. 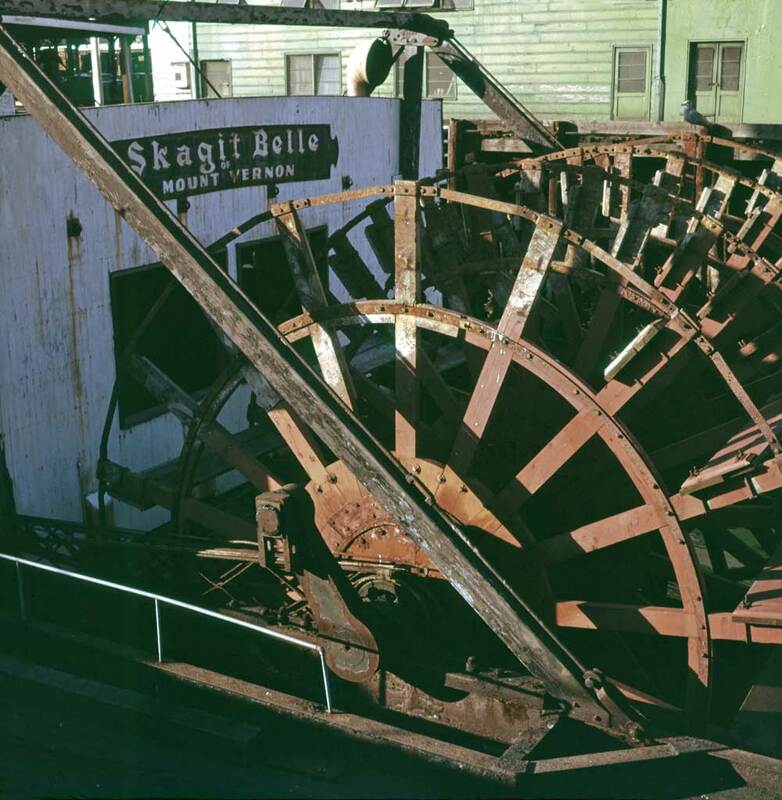 The Skagit Belle was also short-lived. 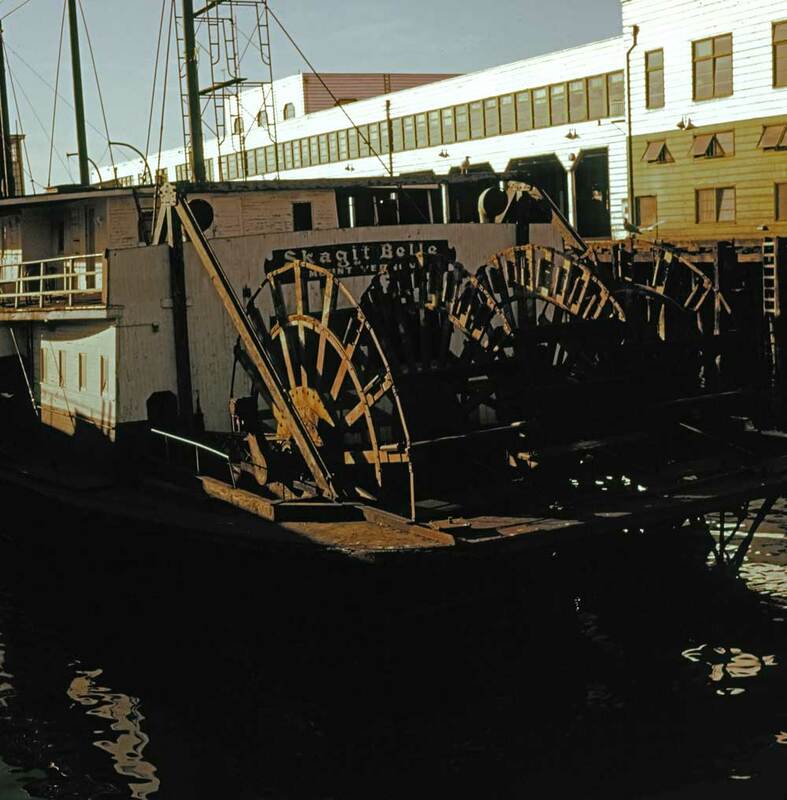 Built in Everett in 1941, it was the last commercial stern-wheel steamboat on Puget Sound. Soon requisitioned for war service, it wasn’t returned to the Skagit River Navigation Co. until 1947. Three years later it joined the Skagit Chief and the steel-hulled W.T. Preston in a race of stern-wheelers for Seafair. The Preston won. 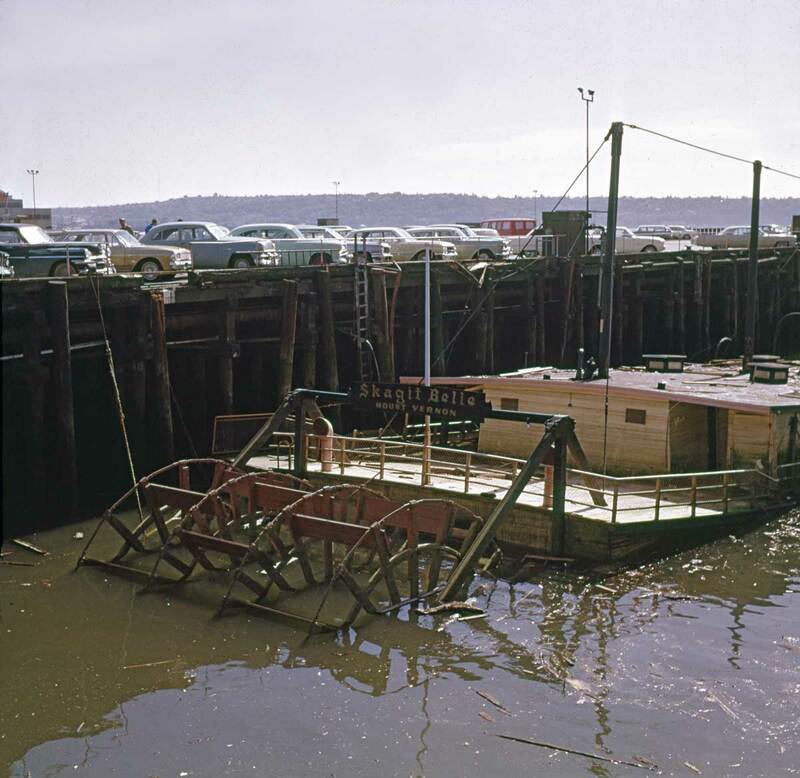 After grounding on a sandbar, the Belle was repaired in Bellingham for her fateful trip to the fair. 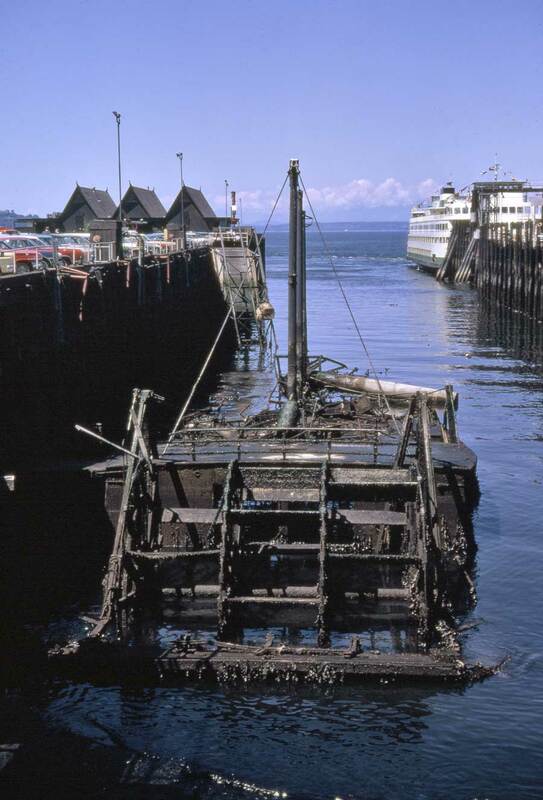 The ship sprang a leak in 1965, its pumps failed, and it sank to the bottom, though still tied to the pier. There it languished through eight years of tides and litigation until hauled away in pieces in 1973. Jean adds a few photos taken nearby that same afternoon in early April. Anything to add, Paul? Yes Jean I did have, and added them too. But I also neglected to publish them. The result – all were erased. I’m off to bed now and will do it all again in the morning. “It” is several slides of both the Skagit Belle and the Polynesian during the 1960s. Tomorrow then and nighty bears* to all for now. 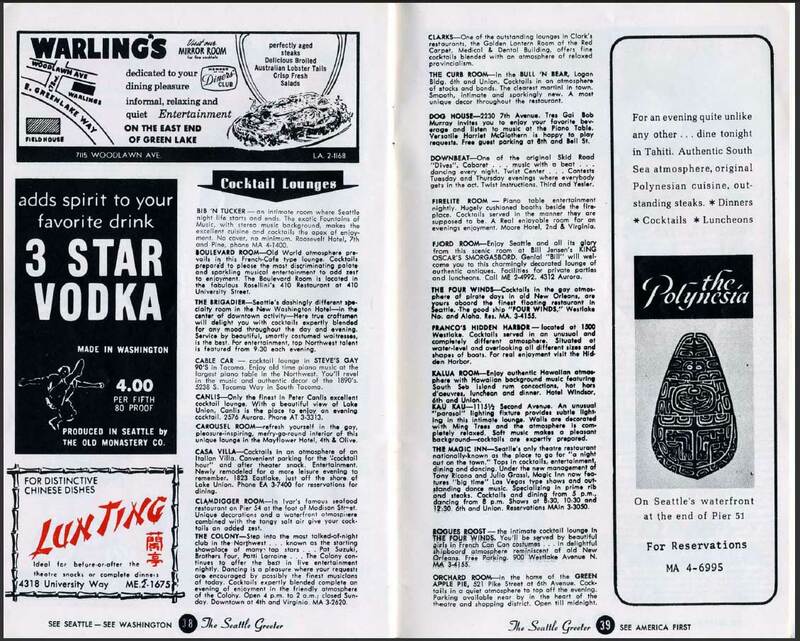 * “Nighty Bears” is a welcomed substitute for the commonplace “Good Night.” It was taught to many of us by Bill Burden in the late 1970s and we have – as extended family – continued to use it. Like the above scene this was also recorded on May 6, 1961. May 29, 1961. 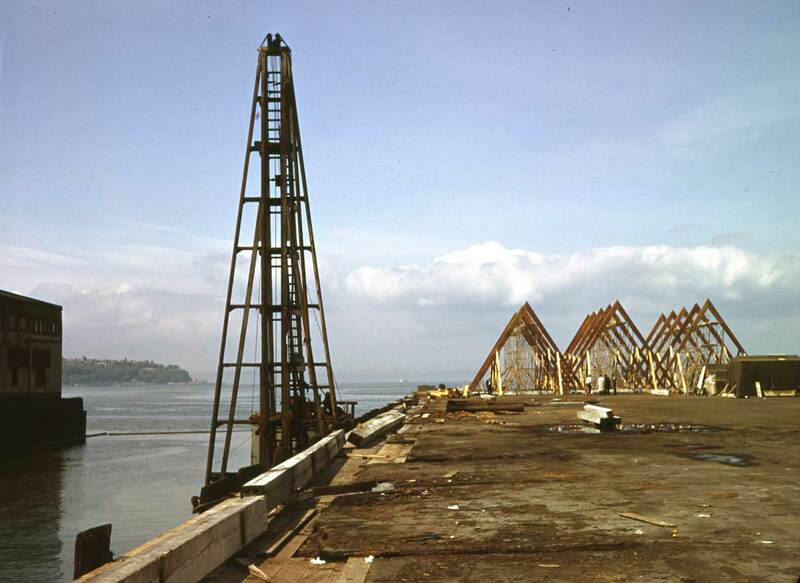 The ends of both Pier 50 with the last remnants of its pier shed, and Pier 51 with the Polynesian, as seen from the Pergola at the foot of Washington Street. The Harbor Partorl boat can be glimpsed through the railing. June 26, 1921. Century 21 is open and the Bounty visits pier 51 and the completed Polynesian. How appropriate. Feb. 24, 1962. 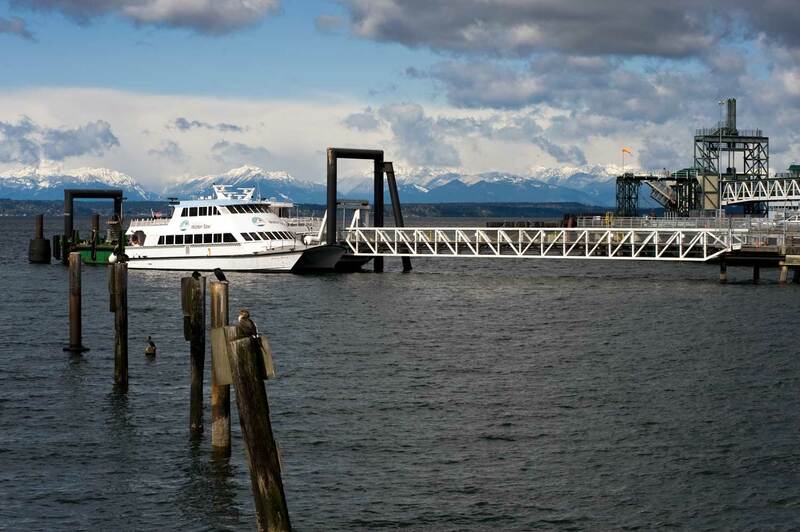 In place now on the north side of Pier 51, the Skagit Belle is still waiting for its make-over. Feb. 24, 1962. 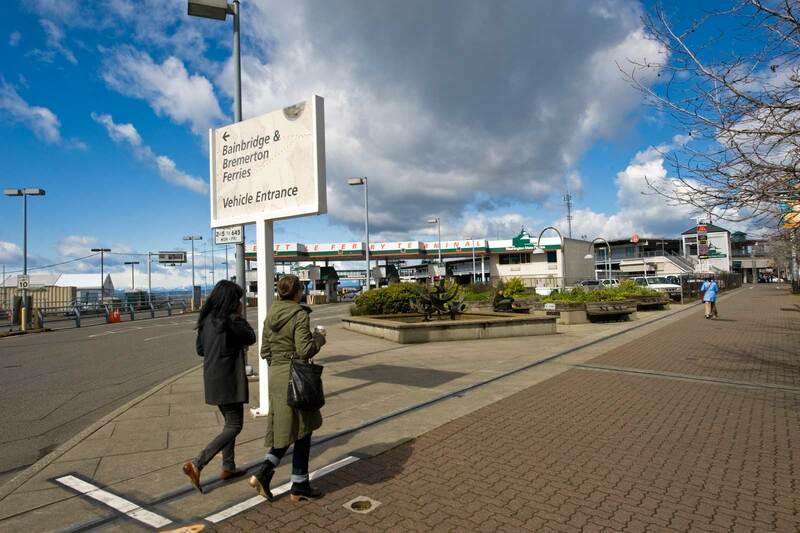 Another view of its unpolished rear with Colman Dock beyond. 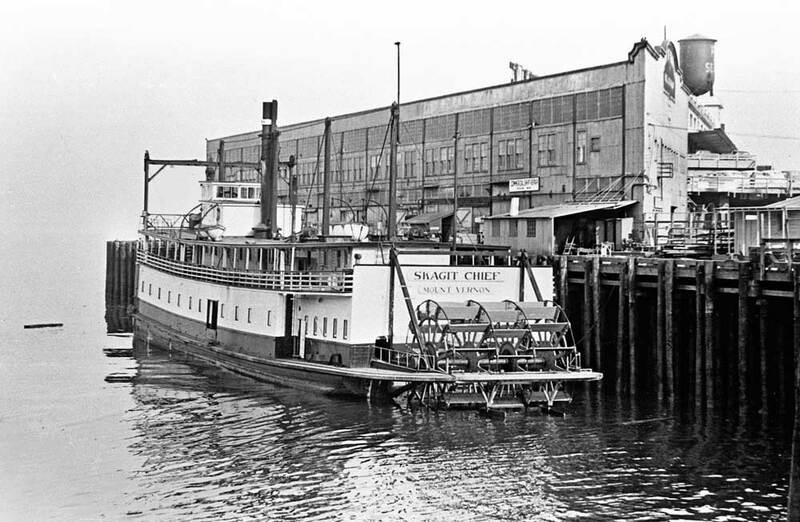 Frank Shaw, it seems, took no slides of the Skagit Belle during Century 21, or following it when the vessel gave its last work as a restaurant. This is one of several recordings of the sternwheeler after it sprung a leak. It dates from June 19, 1965. May 19, 1965 With Ye Olde Curiosity Shop to the rear. 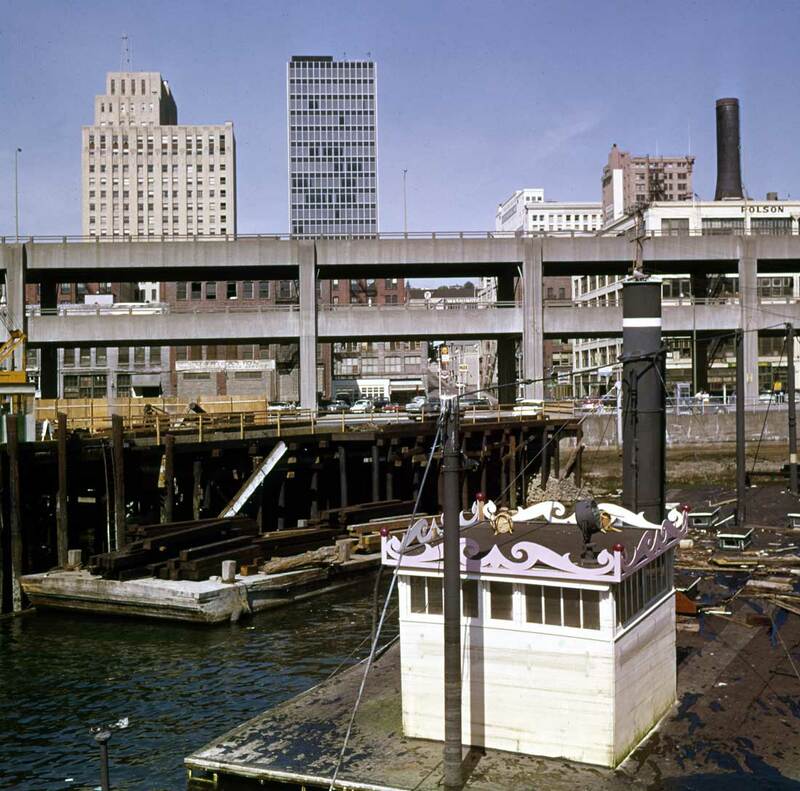 June 19, 1965 With Pier 51 parking to the rear. June 16, 1965 With the Exchange Building (1931) and the Norton Building (1959, Seattle's first highrise glass curtain) beyond, left and right respectively. 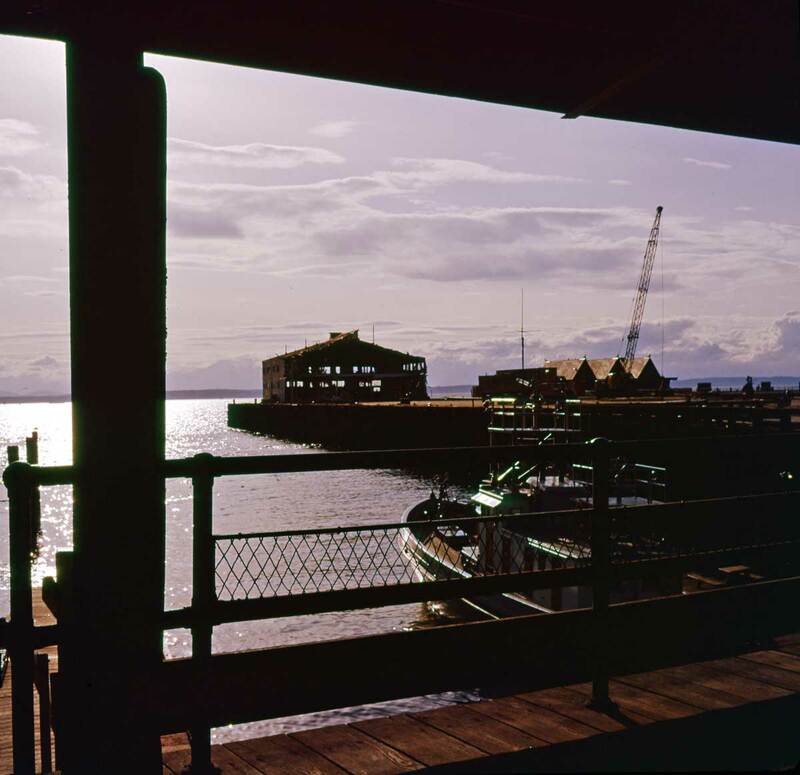 June 30, 1969: time passes, the litigation continues and the Skagit Belle decays, witness to the struggle of making it on the waterfront. None of the ABOVE should be confused with any of the BELOW. 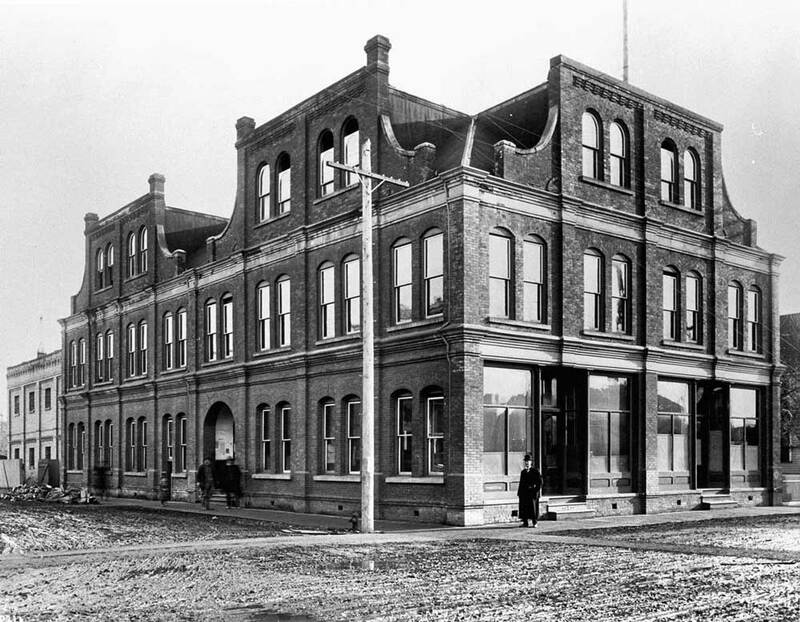 The Skagit Chief at the south end of the old Port of Seattle headquarters at Pier 66. 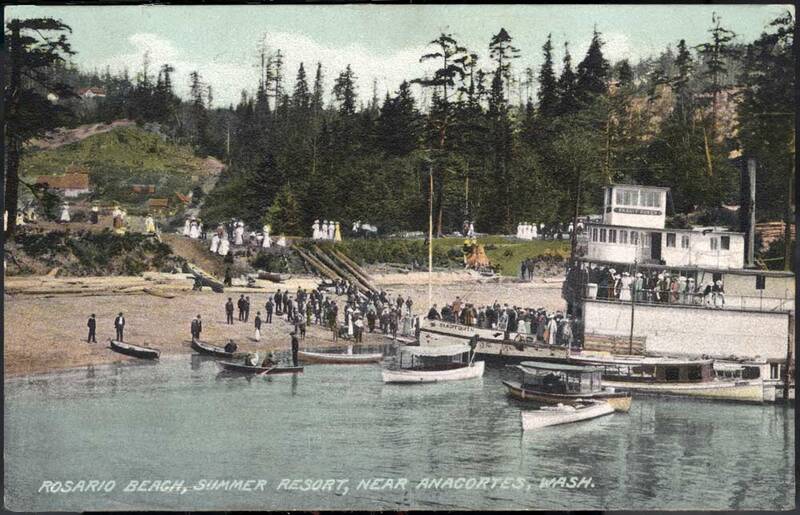 The Skagit Queen nosed into Rosario Beach ca. 1910. The Skagit County Courthouse in Mt. Vernon ca. 1910. Below is Jean's ca. 2007 repeat of the courthouse long after the humiliation of losing it curvaceous top floor. Previous PostOur Daily Sykes #52 – Roadside GradeNext PostTHIS DAY – actually yesterday – IN HISTORY: Some Notable Events from the Sixth Day of the Sixth Month! Re “Peerless sites on the pier” and the sternwheeler Skagit Belle…too bad you ran out of column space. You write that “its pumps failed.” Not so. My recollection is that Seattle City Light cut off the power due to a delinquent electric bill. Had the power not been cut off — a severe and mindless penalty, your “then” and “now” photos today might differ only by the thickness of a new coat of paint and a priceless 45 year history of good time tour rides. You may be right – but you may be wrong. 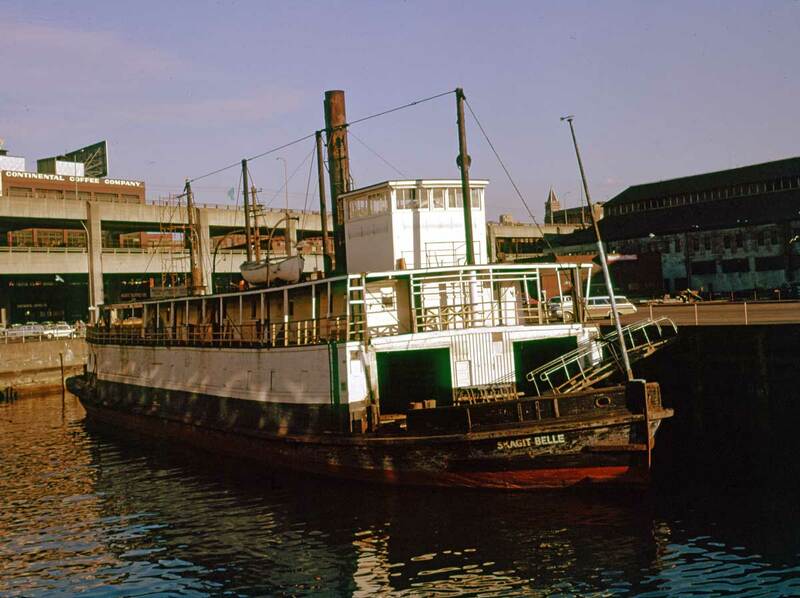 The old converted “Mosquito Fleet” steamer City of Everett that was moored at the southwest corner of Lake Union and served there food for a fare for several years (the name escapes me for this moment – and several others) also sank. Of that sinking I am more confident. City Light cut the power for want of payment. This does not preclude the possibility that City Light pulled the switch twice, once each for two poor vessels, but it also introduces the possibility that you may be thinking-writing of that Lake Union sinking. In my research – limited as it was – on the Skagit Belle I do not remember anything about cutting the power. If I had I’d have probably registered it as the second such incidence and enjoyed the improbability, but I did not. Also Peter we don’t run out of column space in this media. Nor do we run out of pictorial space. Nor of color. Nor of appreciation for its readers. Thanks for your comment. You may be right but you may be wrong. The next chapter in the history of the Skagit Belle is the period that I observed close up and inspired me to write this story. The water line of the vessel was a foot or two above the floor of the lower deck. The wooden planks below the water line are always wet and swollen, keeping the hull watertight. Those planks above the water line will dry and shrink. Thousands of people walked by and admired the old riverboat, but I was one of the few who went aboard regularly. I soon noticed that light was coming through between the hull planks just above the water line. It was obvious that as she settled lower in the water there would be trouble. As water accumulates in the bilge, the area below the floor, the ship will sit deeper at its birth. If the bilge pumps are not activated, almost always automatic as on the Belle, water will at the critical time come gushing in and the ship will sink. The electricity had been disconnected, so no bilge pumps. I rushed a call to the owners, also our landlord, to learn that they were out of money and owed a big electric bill. It looked as if they were going into bankruptcy. I called the Coast Guard, who assessed the scene and reported that in a short time the ship would sink. The city engineer agreed, as did the fire department. What the hell is going on? Because of a legal technicality, the city attorneys and those of the Coast guard as well as the attorneys of our landlord forbade the city and the Coast Guard from becoming involved. Likewise my attorney, advised me to keep hands off . If I ran an electric wire to activate the pumps I could be held liable when and if the vessel sank. We were going to lose this irreplaceable museum piece with lots of equipment on board. 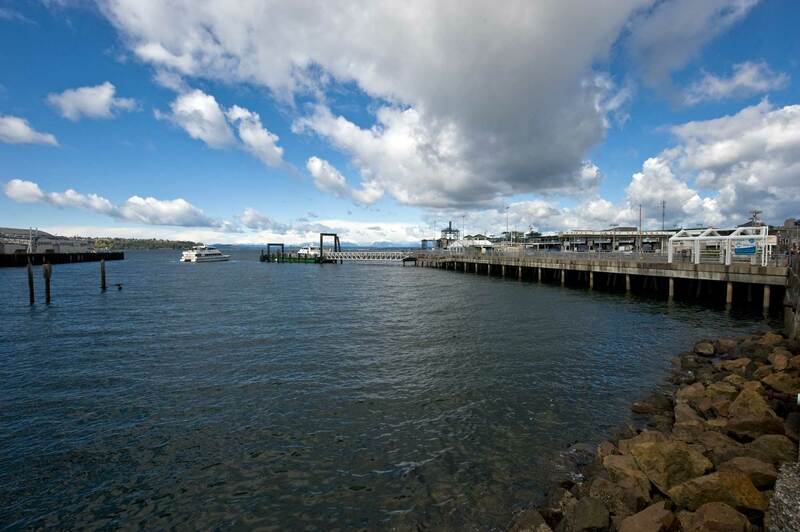 Thousands of people walking by will see the wheel- house break up, which is all that will protrude above the sea water. 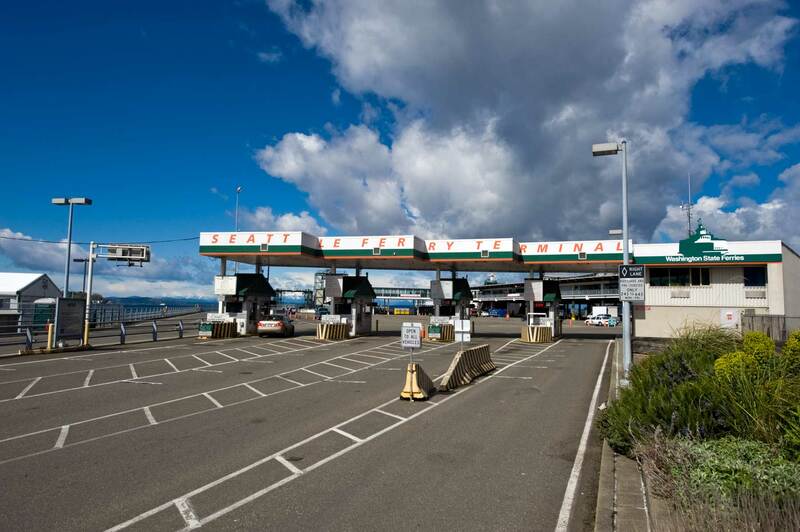 Seattle taxpayers will end up paying thousands of dollars to remove the hull; now, by throwing a switch, City Light, a city-owned company, could activate those pumps. The pumps were off for about six weeks when she went down, slowly at first and then quickly into 20 feet of water and five feet of mud. Within days the city appropriated $12,000 needed to remove the wreckage. Thanks to you both, Debra and Harry. A splendid addition: experienced and intimate. As someone who worked at the Polynesia restaurant in the 70’s, I just wanted to correct your spelling: It was “Polynesia”, NOT “Polynesian” (i.e. no “n” at the end.) Otherwise, I loved this article. Does anyone have a copy of a menu from the Polynesia; it was my favorite restaurant. Just a copy?? I’m too young to have lived through the “then” photos of Seattle. But I have seen plenty of these vintage buildings and apartments. 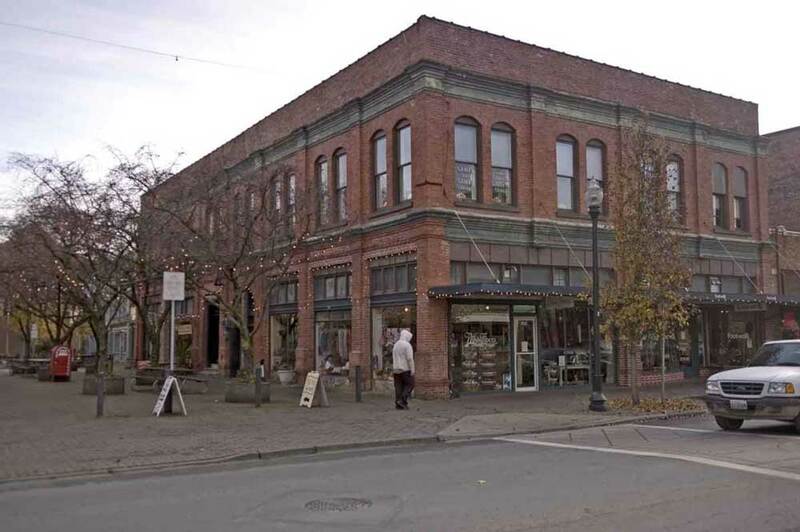 Anyone who would demolish vintage buildings in favour of newer buildings should have his head examined.